This Adorable Pup Is Enjoying Her Time Playing With Her Toy And Getting Pets From Dad! We all love our pups – they never fail to be the cutest thing around! And for those of us who own Labrador Retrievers, we will know just how eager these pups can be to please us, and how clumsy they can also be! It is probably something that will always come hand-in-hand with being energetic and unaware of their own size, we suppose. 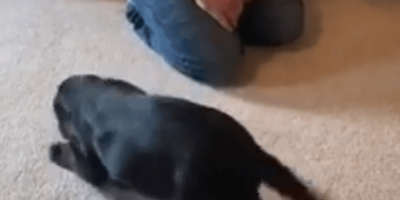 This black Labrador Retriever is just a great example of that high energy excitement. It seems the only time her tail isn’t whipping about is when she is distracted by something outside the window – otherwise her tail is constantly whipping back-and-forth, ready to knock something over! What a happy puppy. It is clear that she is just enjoying her time playing with her toy and getting pets from Dad! What a wonderful thing it must be, to be able to fully appreciate and enjoy the little things in life. Certainly, an attitude we can all learn from! The Bond This Baby Shares With This Adorable Pup Is Just Too Priceless! These Parents Decided To Make A Video Montage Celebrating Their Pup’s Birthday!